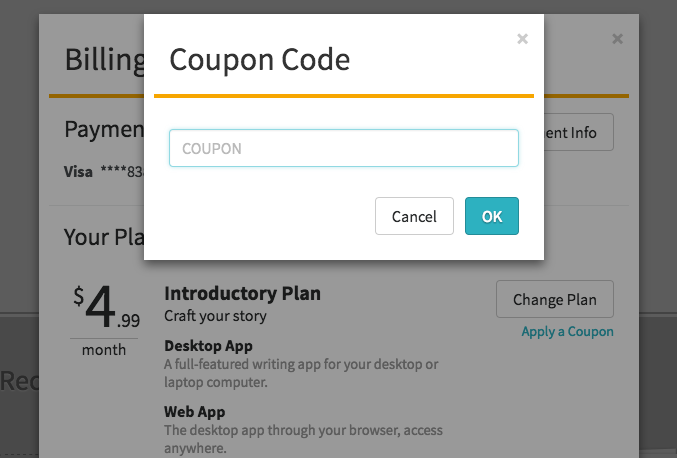 Learn how to apply a coupon code to discount your Dabble subscription. You can apply a coupon to discount your existing Dabble subscription at any time. You may also apply a coupon when you resubscribe or change plans. To view your current subscription status and plan, click on the account menu at the top right of Dabble (the menu with your name). Then click on “Billing”. The billing screen will show you your current subscription plan, if any, and allow you to apply a discount to it. Click on the link “Apply Coupon” and enter your coupon code in the box. Uppercase or lowercase, it doesn't matter as long as you have the right letters and numbers. After you hit “OK” the coupon will be applied if it is valid. If you are not currently subscribed or want to change plans, you can select “Change Plan” and after selecting a plan, you will be able to enter a coupon before confirming the new plan choice. Click on the link “Apply Coupon” and enter your coupon code in the box. It will be applied to the new plan as long as it is valid.